Dyes are widely used in industries such as textiles, cosmetics, food processing, papermaking and plastics. Globally, we produce about 700,000 metric tons—the weight of two Empire State Buildings—of dye each year to color our clothing, eye shadow, toys and vending machine candy. During manufacturing, about a tenth of all dye products are discharged into the waste stream. Most of these dyes escape conventional wastewater-treatment processes and remain in the environment, often reaching lakes, rivers and holding ponds, and contaminating the water for the aquatic plants and animals that live there. Even just a little added color can block sunlight and prevent plant photosynthesis, which disrupts the entire aquatic ecosystem. 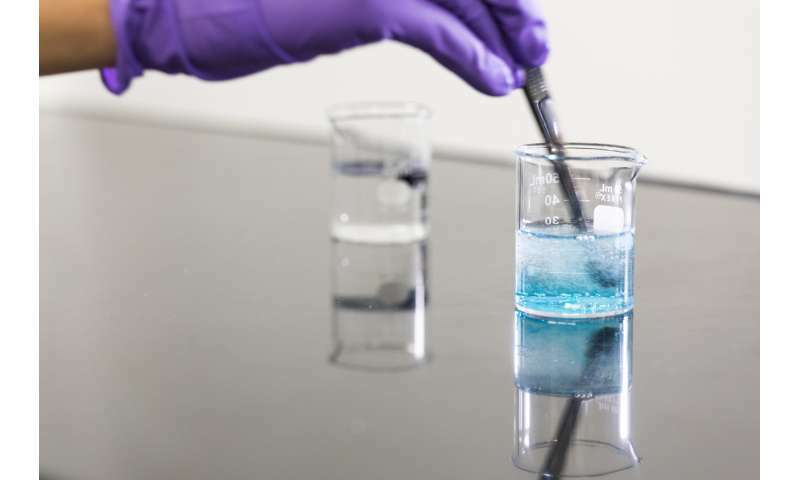 A team led by the University of Washington has created an environmentally friendly way to remove color from dyes in water in a matter of seconds. The technique was described in a paper published online in June in the journal Applied Catalysis B: Environmental. "A small amount of dye can pollute a large volume of water, so we needed to find a way to very quickly and efficiently remove the color," said senior author Anthony Dichiara, an assistant professor of bioresource science and engineering in the UW School of Environmental and Forest Sciences. "We were pretty impressed with what we were able to achieve." 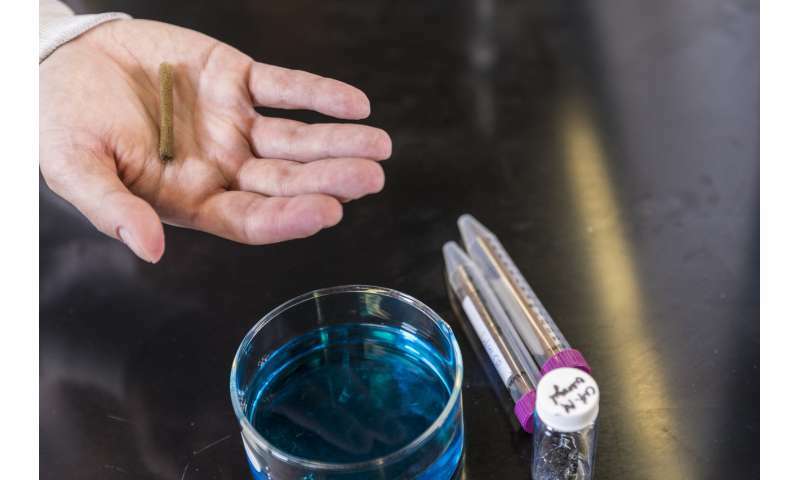 The research team developed a method that removes color from water using a sponge-like material they created from wood pulp and small bits of metal. Cellulose, the main structure in plant cell walls and the most abundant natural material on Earth, provides the backbone of the material, which is decorated with tiny pieces of palladium. This metal serves as a catalyst to help remove color quickly. Instead of removing dye from water, the research team sought to change the color of the dyes to something that falls outside of what we can see in the visible spectrum. A chemical reaction can, for example, disrupt the color red and make it appear clear, or colorless. In the case of dye waste products that artificially color the water in lakes and prevent photosynthesis, changing the dye from red to clear should allow plants to grow normally again. The chemical reduction of dyes using molecules called "reducing agents" can alter the dye structure and change its color from red or blue to clear. However, the reaction is not very efficient and can take weeks to occur. The UW's material contains a catalyst that works with the reducing agent to speed this process up to almost instantaneous. In the new paper, the researchers describe the simple and sustainable process they developed to make the color-removing material. The researchers combined cellulose molecules with palladium metal, heated the solution and mixed it in a blender. Then they purified and freeze-dried the material so it became a porous, reusable substance. The resulting sponge is more than 99 percent air—its large pores allow water to flow in and out, while the metal catalyst particles within the material work to remove any color present. Just like a real sponge, the material can be squeezed of its water and reused multiple times without losing the ability to remove color from water. The researchers say it is difficult to make such a lightweight material that is flawless after many rounds of squeezing and filtering, especially when the sponge must maintain its Swiss cheese-like structure fused with color-reducing particles. The researchers tested their sponge in the lab using blue and red dyes commonly found in the textile industry. They poured the colored water—already mixed with the existing molecule that helps reduce color—over the sponge. As the liquid passed through the material, the resulting water was clear. In another test, they swirled the sponge material inside a jar containing blue-dyed water, and after about 10 seconds the color disappeared. Outside of lab tests, the researchers say that many small sponge-like materials could be released into a lake polluted with dye, along with the molecule to help reduce the color. Similar to swirling a tea bag round a mug, the sponges could be dragged around the lake until all of the color disappears. "Just a little amount of dye can change the color of a lake dramatically," Dichiara said. "This method could work well when you have low concentrations of dye in water that you need to take care of really quickly."